What is a bullion market? Bullions are considered as a safe bet to hedge against inflation or as a safe haven for investment. A bullion market is a market where traders trade in precious metals like gold and silver. 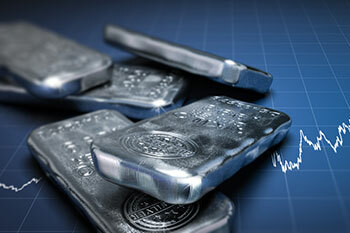 A bullion market is a place where exchanges of gold and silver take place over the counter and in the futures market. Trading in bullions market is open 24 hours. Bullion markets exist across the globe, and most of the transactions take place through electronic means or by phone. The versatile uses of silver and gold in many areas especially its industrial applications decide the prices of the precious metal. Bullions are considered as a safe bet to hedge against inflation or as a safe haven for investment. There are other avenues to invest in these markets such as exchange-traded funds (ETFs), which allow greater flexibility as far as safety and storage issues are concerned. There are a significant number of Gold ETFs available in the market, and the SPDR Gold Trust (GLD) is the most significant gold exchange-traded fund as of November 30, 2017. The primary disadvantage of trading in physical bullion is that it is difficult to store the metal, as there is always a risk of theft associated with it. A bullion market has a lot of active players like banks, fabricators, refiners, vault operators, jewelers, hedgers, arbitrageurs, and speculators, etc. The brokers also facilitate the transactions between parties of two different countries or places. Investing in gold has always been a traditional route for investing. The simple market mechanism for investing in gold is to invest when the price is low and sell the investment when the market is at high. Bullions tend to move at an erratic pace and have different behavioral patterns when compared to the other market securities like equities and funds. This makes it a better bet for hedging and makes it a worthy asset. The London bullion market is the most globally traded market. It deals in gold and silver in futures, options and forwards contracts. The London Bullion Market Association oversees the operations of this bullion market, and it has set specific standards about the quality of the metals transacted. The London bullion market has over 150 members from 30 countries. These members derive majority of the revenue from Gold and Silver bullion trading. The bullion market is also subject to market fluctuations like any another market related security. Investors view bullion trading as a safe haven to hedge against inflation. The bullion market plays a pivotal role in the pricing of gold and silver ornaments all around the world.